Governor Chet Culver says he sides with those who were upset by advertising signs placed on Des Moines city buses that said "Don’t believe in God? You are not alone." The ads sponsored by the Iowa Atheist and Free Thinkers group have now been pulled off the buses. Culver was asked about the ads at an event today. "I was disturbed personally…by the advertisement, I can understand why other Iowans were also disturbed by the message that it sent. But, we’ll see how it unfolds," Culver says. Culver would not say whether he felt the atheist group had a free speech right to have the messages on buses. Culver says:" I think it’s a great question for the attorney general and for legal scholars to kind of sort through that, that balancing act between free speech and the type of message that is being sent. But I do again understand that people were actually not wanting to get on the bus, they were so disturbed by the message that was being sent." The advertising director for the Des Moines Area Regional Transit (DART) system says the agency’s board never approved the signs, but the president of the atheist group said the signs had been approved. Officials says they got complaints as soon as the signs went on the buses. 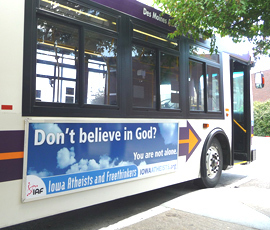 See what the Iowa Atheist and Free Thinkers told Radio Iowa about the bus ads here .